OVERLAND PARK, Kansas – Hoppe’s, the No. 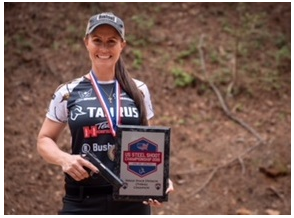 1 name in gun care, congratulates Jessie Harrison on her continued dominance at the 2019 U.S. Steel National Championship in Covington, Georgia. In a field of 460 of the Nation’s top shooters, Harrison won the Overall Single Stack division and the Ladies Open division, delivering her ninth Ladies Open National Title.